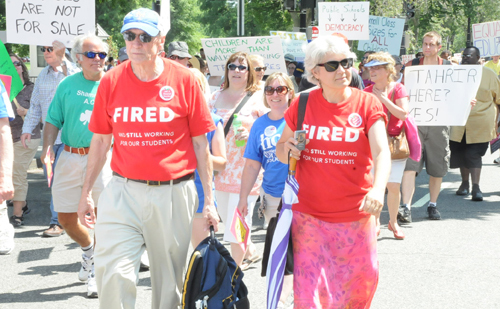 Two teachers who were fired along with every other teacher in their Rhode Island High School because the school was ruled “failing”. Photo by Sharon Schmidt. The public schools are losing well-qualified and experienced teachers who have made a commitment to our communities and dedicated themselves to teaching our children and and yet we are losing them in large numbers. Why? There are many reasons but for the most part is has to do with the phrase “Education Reform”. The term encompasses charter schools and who teaches in those schools, the Common Core Standards, high stakes standardized testing, as well as the failed idea of merit pay for teachers. Charter schools are privately run and just like any other business, the owner/CEO and board of directors want to keep costs down and profits up. One place to save is with labor costs and with charter schools, that means teachers. There are two approaches to this that charter school owners have taken, either hire Teach for America, Inc.recruits with five weeks of training and pay them low wages with a promise of at least something to put on their resumes after their two year stint and/or implement what they like to call“blended learning” or “personalized learning environments.” which means placing a student in front of a computer rather than a teacher to receive whatever education they can. Charter school enterprises also love the Common Core Standards because the curriculum, lesson plans, books and standardized tests are already in place and all the unqualified “teacher” has to do is follow a script. It’s cheap and easy. The teachers union is getting bombarded from two sides right now. First, by billionaires who would rather not see any unions in our country such as the Koch brothers, the Walton’s and corporate backed ALEC and from the other side by charter school enterprises who would love to have certified teachers but don’t want to pay a decent wage to hire them. With Race to the Top we had schools closing based on test scores and then many converted into charter schools and folks like Broad-backed Michelle Rhee who fired several hundred teachers, most of them minority women, basically on a whim. Then you have Common Core Standards and a battery of standardized tests, which make it difficult for a teacher not to teach to a test and thereby narrow their curriculum. This takes a lot out of a teacher who loves teaching, gets excited about their prepared curriculum, which is designed not only in terms of standard expectations but also to the students they are teaching. It destroys any creativity on the part of the teachers and students and makes teaching and learning a rote and tedious daily routine. One young teacher shared with me that the curriculum with the barrage of standardized testing and pressure for students to perform well on the tests is “soul crushing”. Hearing that broke my heart. But…you hear that in many places where teachers are not afraid to share what they see, hear and feel about this dark time in public education. With that introduction, I give you Brett Dickerson, who taught in public school for 16 years and is now a writer, blogger, independent reporter and a teacher in an adult ESL program. Even though experienced teachers as a group have a high degree of love for their students and their work, they are leaving education in large numbers. The teacher brain drain has been happening for about ten years now, and very little grief expressed. Why? An NPR report by Yuki Noguchi titled “Businesses Try To Stave Off Brain Drain As Boomers Retire” shows the deep concern across industry and business about people with knowledge and decades of experience leaving. The report shows the lengths that some industries are willing to go to keep the most experienced workers on the job, even after retirement. They are considered too valuable to allow them to just walk out of the door for the last time. Business and industry seem to understand that experience and knowledge are important to success, especially when it comes to workers who not only know the information and the concepts of their work, but the experience and base of knowledge that the experience has generated. So if this is the current view of the threat of a brain drain in other areas work in the U.S., especially that require extensive educations and experience to know how to use them, why are veteran teachers so disparaged right now in practice and discourse in the press? For the last ten years now, a steady drumbeat of trash talk about teachers has made its way into the public comments about education. Experienced teachers are portrayed as lazy and incompetent, incapable of teaching students in any kind of adequate way. Teachers unions are pointed out as a telling sign that teachers know that they are no good and need “job protection” with tenure laws. None of these statements accurately portray the quality of teaching or the actual situation of most students who graduate from public schools. Why would these be circulated so widely? To understand the teacher brain drain we have to get the reality of what passes as “education reform” in the press and media. True reformers want to engage those who have the most experience in the classroom and in leading teachers as administrators. To achieve reform, there must be a collaboration and engagement of those who know what needs to be reformed the best. But that’s not what is going on, is it? That’s because those who call themselves “education reformers” usually are not. Instead they are those who want only to raid public funds taken by force as taxes and then converted to the wealth of investors who do not care about your children, only their own. The self-designation of “reformer” by people who have never been in the classroom and have no actual training or experience in education is a smokescreen. What they are really after is profitability for their investor-owned charter school corporations that will deliver as little education for the buck as they think they can get by with. I refer to them as “school raiders” because that’s the best description for them. As I have argued in an earlier post, they are not that much different from the corporate raiders of the 1980s who were only interested in the cash that they could gain by buying up productive companies and then liquidating them. I have not seen any credible argument that our industrial capacity has increased since the 1980s because of the “efficiencies” that those corporate raiders promised. Instead it created a shock to our jobs and economy that has not yet recovered. It was the rich minority getting richer at the expense of the rest of us in the loss of jobs and the economy that depended on those jobs. It was the beginning of outsourcing of work that has not yet ended. It’s why we have seen a jobless recovery since the recession that started in 2008. And yet we have an inexplicably compliant press that does not ask the important questions about how those charter corporations will save money and increase the knowledge of their students. In experimental situations like New Orleans, Detroit, and Newark, we are seeing quite well that the new school raiders are no more productive than the old corporate raiders were in the 1980’s if referring to the productivity of whatever they take over. They have no intention of being. What they are after is the most money made for the least spent with as little time being taken on what non-educators would see as pointless discussions. The brain drain in education is actually being engineered by think tanks and public officials funded by these school raiders because experienced teachers ask too many questions. We want to know why, as any experienced professional would. We are smart and know how and when to object when it is important to protecting the future of all children not just those of the rich. So, school raiders believe that they must do two things: hire teachers who are compliant, who will teach children to be compliant. In order to achieve that, they had to eliminate the respect that teachers and their associations have had over the years, not to mention the teacher education programs. They diverge from the rest of American business in the exact same way that the corporate raiders did in the 1980s when it comes to the brain drain. Why worry about a brain drain when it is profitable to have “those people” out of the way in the first place?